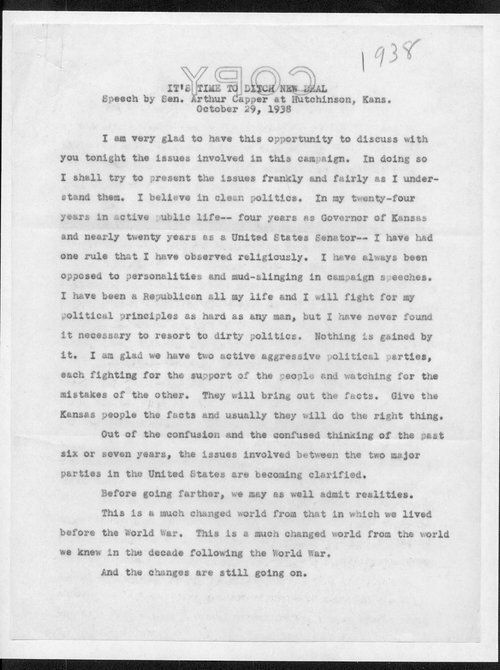 This copy of a speech given by Senator Arthur Capper of Kansas at Hutchinson, Kansas, details the reasons why he believes the U.S. must move away from President Roosevelt's New Deal. Primarily, Capper argues that the U.S. must be careful in order to preserve democracy and "local self government in local affairs." If not, Capper contends that the U.S. could become like some nations in Europe where the individual is "merely an atom, a vassal of the state." For Capper, therefore, the major question of the day was whether the people would maintain the primary role in running the nation, or if the government was going to be allowed to "run the people." This item can be used in conjunction with other items on the WPA and the alteration of the Kansas Landscape during the New Deal-era. In addition, this item is particularly useful because it provides concrete evidence that many Americans feared the changes brought about by the New Deal despite its many positive aspects.